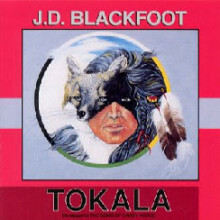 Tokala was recorded at J.D.s own, world class, Sisapa Recording Studios in Columbus, OH in 1991. (Sisapa means Blackfoot in the Lakota language, however J.D. is not of Native American Ancestry.) The sequel to “The Song of Crazy Horse”, with the title track “Tokala,” consisting of 5 songs, tells a 25-minute saga of a young seeker who asks his Grandfather to help him find his path and start his vision quest to re-connect to the forgotten ways of the past. Tokala means gray fox in the Lakota language. J.D. learned the ways of the fox as a young boy, both from stories from his Grandfather who had fox hounds, and his father who took him on fox hunts and told him more of grandfather’s stories.